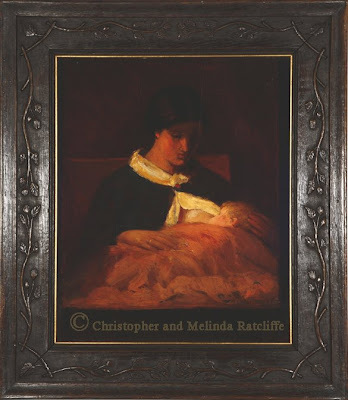 Christopher and Melinda Ratcliffe, owners of the above painting by Charles Walter Stetson (first husband of Charlotte Perkins Gilman and father of Katharine), have kindly offered this website the opportunity to post this stunning mother/daughter image, adding yet another important piece to the Gilman literary canon. This entry has been updated from December 2008, when this it was first posted. My wife and I own this painting of Charlotte Perkins Gilman with her daughter, Katharine. The artist was Charlotte’s first husband, Charles Walter Stetson. In this painting titled Evening. Mother + Child and dated 1886-1887, Charlotte is breastfeeding Katharine. Charles Walter Stetson writes in his journal that the painting was copied from a sketch he made of Charlotte and Katharine in 1885. The painting was done using the glow of a lamplight, giving it a very intimate air. We believe that the artist painted her likeness through a mirror, thus her wedding ring appears on the wrong finger. The baby? I nursed her for five months. I would hold her close – that lovely child! – and instead of love and happiness, feel only pain. The tears ran down on my breast.... Nothing was utterly more bitter than this, that even motherhood brought no joy. The painting was exhibited at the Providence Art Club in May of 1887 while Charlotte was in Pennsylvania being treated by Dr. Weir Mitchell. It was sold (we believe by Charlotte) to Mrs. George Cresson of Narragansett, Rhode Island, and Philadelphia, Pennsylvania, in October of 1888. 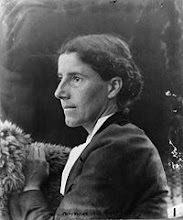 It is our belief that its sale was used to partially fund Charlotte’s October trip to Pasadena, California, where she settled after leaving her husband. Mrs. Cresson died in 1907 and her husband died in 1908. We believe the painting was either purchased from the Cresson estate by Charles Walter Stetson or left to Katharine by the Cresson estate. Probate records from the Cresson estate do not give specifics on how their artwork was divided. Regardless, the painting was given to Katharine in 1909 (Charles references the gift of the painting to Katharine in his diary). It was then included in the Memorial Exhibition of 1912-1914, after Stetson’s death in 1911, traveling to the Metropolitan Museum in New York, the Museum of Fine Arts in Boston, the Pennsylvania Academy of Fine Arts, the Art Institute of Chicago, the Detroit Museum of Art, and the Toledo Museum of Art, among others. The title of the painting during the exhibition was changed to Mother Nursing Child. Stop at Walter’s. Criticize his pictures, one so harshly from a moral point of view that he smashes & burns it. I feel badly; and after some tears he comes home with me. We know from Charles’s diary that Stetson was working on the painting in November 1886 and that it was completed on February 5th, 1887. But why did the composition take so long? One theory is that it was this painting, with Charlotte breastfeeding Katharine that Charles smashed and then repaired. Also, according to historical records from October 9, 1886, the temperature reached 84 degrees on that date making it doubtful that Stetson would have lit the fireplace in his Providence studio. An image of the painting can be found in a book titled The Selected Letters of Charlotte Perkins Gilman by Denise Knight and Jennifer Tuttle, and in another book, Wild Unrest, by Helen Horowitz. It is also the cover art for another book titled Charlotte Perkins Gilman’s Short Stories and Social Criticism, by Gamzi Sabanci. The painting was exhibited at the Belmont Sewall House and Museum in Washington D.C. in 2012 and 2013.